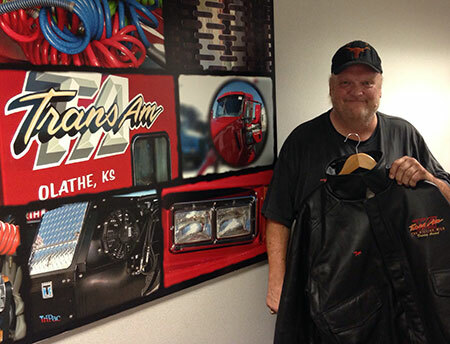 Tim Antle recently celebrated driving 2 million miles with TransAm Trucking. What does he plan to do next? “How about another million?” he said during his Jacket Award Ceremony. Tim started with TransAm Trucking 17 years ago and does not plan to stop any time soon. Tim is a trucking veteran, having been in the industry for 20 years. Tim will tell you his uncle greatly influenced his decision to become a truck driver. His uncle was a truck driver for 25 years and owns the trucking company where Tim got his start in the industry. “It’s where I got the travel bug,” he says. After two more trucking companies, Tim eventually ended up at TransAm Trucking because of our long-haul routes and top-of-the-line equipment. TransAm Trucking was not his first choice, but after 17 years, it has proven to be the lasting one. Tim is a steadfast company driver. 2 million, accident-free miles is a great achievement. We are glad that Tim eventually found his way to TransAm Trucking. His is a great asset to our team. Thank you, Tim. We look forward to the next million miles.